When drought strikes, Thailand turns to its Royal Rainmakers—an airborne team which seeds the clouds over the kingdom. The country is the grip of its worst drought for decades, with 22 of its 76 provinces affected. 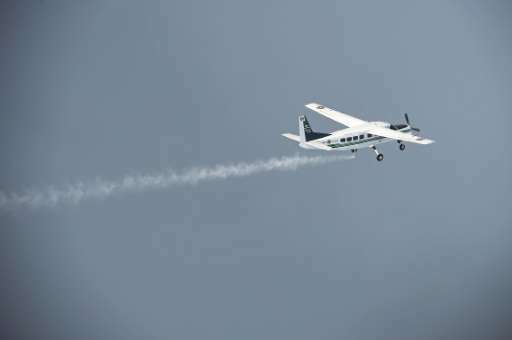 So the Thai Department of Royal Rainmaking is sending up its planes to try to cajole the clouds into producing rain. "The first step is making clouds by spraying salt-powder," according to Wiraphon Sudchada, a scientist who is part of the team. "Then we mix calcium chloride and calcium oxide and spray it into clouds carrying humidity to make them bigger," he added. "We also spray ice beneath the clouds so that it will rain faster." The current drought has hit northern Thailand hardest, raising fears of taps running dry as levels in reservoirs dip to record lows. Last year's rains came late and infrequently and desperate farmers hope the heavens will open come the arrival of the monsoon season in June. Rainmaking has a storied history in Thailand. People credit their revered current monarch King Bhumibol Adulyadej with driving rainmaking projects back in the late 1960s.